Altapure’s technology is capable of very quietly producing a large dense cloud of sub – micron size droplets which we call SMDF ™ (Sub-Micron Dense Fog ™). Due to the extremely small size of the droplets, it is “cloud-like” to the touch. The aerosol is also “cool” to the touch. The small droplet size of SMDF ™ allows the aerosolized sterilant / disinfectant, to retain the chemical properties of its liquid source, but also behave “like a gas”. This allows the aerosol to quickly flow into and throughout the room or treated area and interact with the surfaces in these spaces regardless of their geometry, locations, or distance from the Altapure device. Due to the “gas-like” nature, the aerosol can fill and treat multiple connected areas, complex geometries, long horizontal and vertical runs, and high-level disinfect and/or decontaminate the various surfaces within these spaces, including any equipment or objects therein. The result is a complete coverage and treatment of all exposed surfaces within the treated room. The average droplet size of Altapure’s generated aerosol fog is 0.69 microns, as characterized by a major university. Physics dictate that diffusion, hang time, and penetration, are inversely related to droplet size. It also means surfaces will be much drier when treated with the Altapure system. 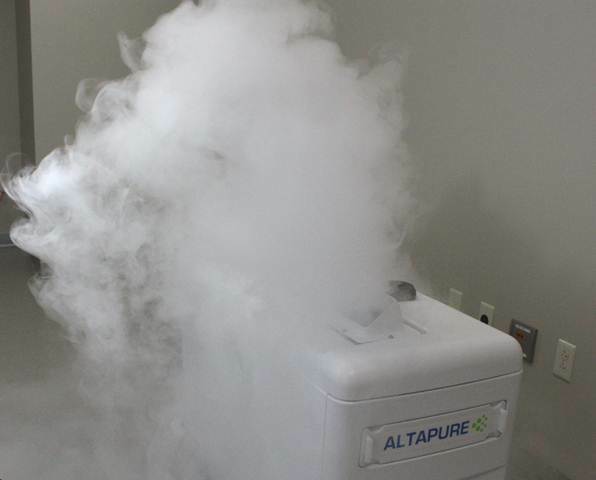 Altapure’s technology is capable of rapidly producing an extremely dense plume and high volume output of the sub-micron size aerosol fog droplets, as evident in the pictures and videos. The small droplet size of Altapure’s aerosol also allows the aerosolized sterilant / disinfectant, to retain the chemical properties of its liquid source, while still behaving “like a gas,” achieving diffusion and penetration capabilities that are far superior to any other aerosol generator methods to date. The small droplet size of the aerosol facilitates a quick deposition of an "extremely thin film” with sub-micron droplet performance of the aerosolized sterilant / disinfectant onto the targeted surfaces. In short, Altapure’s small droplets possess the best of both worlds, imitating the diffusion and penetration capabilities of a gas, while still maintaining the anti-microbial power and full efficacy of the source liquid. While disinfection gas technologies like vaporized hydrogen peroxide (VHP) also possess good diffusion and penetration capabilities, the sparse density of the gas molecules require tremendously higher concentrations of the agent (35% or more) to achieve its efficacy, posing issues of safety, corrosion, and/or requiring substantially longer treatment / exposure times. Prior to Altapure’s technology, there was no commercially viable method to generate useful quantities of aerosol particles below approximately 7-10 microns in size. Altapure’s average aerosol size of 0.69 micron is approximately 91% less in diameter when compared to droplet sizes of even 8 micron generated by other commercially available high volume aerosol sources. These larger drops deposit as a residue, large volumes of the source liquid. An 8 micron drop has 512 times more liquid as compared to a 1 micron droplet, and 2,370 times more liquid when compared to a 0.6 micron droplet diameter. The increased amount of liquid in these “large droplets” can leave surfaces and items visibly wet. The larger droplet size also prevents penetration of materials and diffusion into remote or “protected” spaces, both directly, due to their size, and indirectly because their greater mass causes them to move and diffuse slowly while quickly “raining” out of the air. In contrast, Altapure’s sub-micron droplets, stay airborne long enough to penetrate and interact with surfaces of any geometry or orientation, and their small size, very slow settling velocity (long hang time before they settle out of the air), and the extremely dense nature of the deployed aerosol itself, contribute to Altapure’s efficacy. For example, the settling velocity of a 1 micron droplet is almost 56 times slower than a 8-micron droplet, while further reducing the droplet size to 0.6 microns shows an additional benefit of almost 143 times slower than an 8-micron droplet. In another example, the diffusion of a 1 micron droplet is almost 9 times faster than a 8 micron droplet, while further reducing the droplet size to 0.6-microns shows an additional benefit of almost 16.5 times faster than a 8 micron droplet. As would be expected with the sub-micron size droplets, Altapure’s aerosol exhibits exceptional, gas-like, diffusion and penetration properties. In addition, Altapure’s sub-micron droplets, enables the process to leave only an extremely thin film deposition on surfaces, which then rapidly evaporates at cycle completion, leaving a dry post-treatment environment and providing quick turn around times.